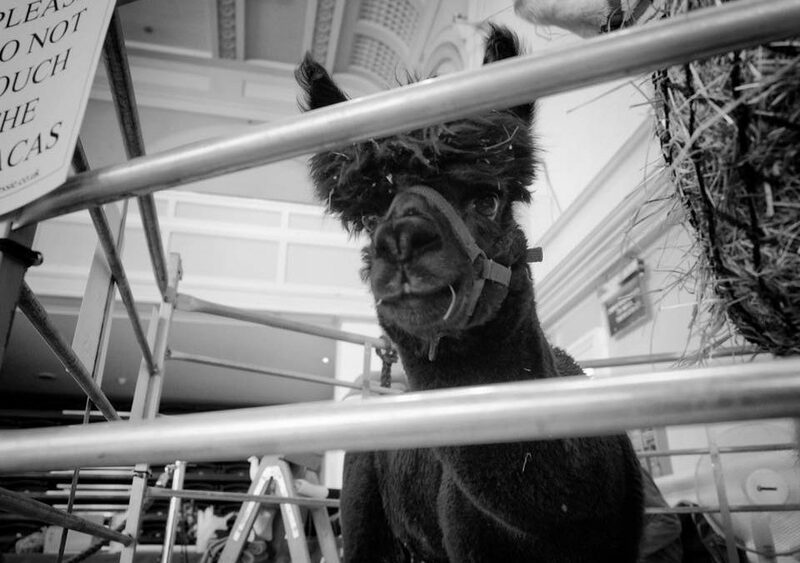 On Sunday 19th November Ted & Bessie exhibited at the Bedford Artisan Fair – our first indoor fair with alpacas! It was a particularly early start (up at 04:30!) to prep the boys for their first outing in the new trailer. Luke and Kilimanjaro, picked for today’s venture based on their inquisitive nature and likelihood to stand still for food, were loaded with all the fencing and other gear, and off we went. The excitement began soon after arriving and setting up the pen, when it was found that the boys would have to enter the building by way of a short lift journey up one floor..! They were, however, very well behaved and were soon settled in their pen, munching hay and humming gently. By 10 all the other vendors had arrived and set up (after ‘ooh’-ing and ‘aah’-ing over the boys), and the fair was open. Plenty of people showed interest in us throughout the morning, enchanted by the boys, and intrigued by our ethical practices and our ‘green’ way of thinking; it’s always lovely when people appreciate what you do as a company, especially when you put so much time and passion into it. We took the boys home around lunchtime as Luke was starting to get restless, wanting to stretch his legs, but they did very well for so many unknown variables. The afternoon also sped by, with the new line going down very well; especially the snoods – they were a particular highlight! A few mulled wines later it was time to pack up and head home, pleased with our progress and looking forward to the upcoming Winter Season.